Is it weird to crush up a cookie to make a new cookies? I don't think so , I actually think it's kind of my best idea ever (although I am sure that I am not the first to think of this). I now have this desire to make all sorts of crushed cookie cookies and crushed cake cookies, and crushed up cookies in cinnamon buns and you get the idea. Picture it now. A cookie full of huge hunks of birthday cake, or a crushed chocolate chip cookie inside a chocolate chocolate cookie crushed up inside of a peanut butter cookie rolled in crushed up chips....This could get dangerous. Not going to lie, these cookies were 99 percent inspired but Lindsey Lohan. And no, not because they are like crack (although that's what the mr's brother thought) but because of the movie, The Parent Trap. Yes, it is now on Hulu and yes, I watched it, and yes I was by myself, and no I will not feel shame for that. In the movie the Lindsey's (well, the one Lindsey that plays two Lindsey's.. you should watch it if you don't know what I am talking about) are away at summer camp being all innocent and cute (what happened to you Lindsey?) but get into a little trouble and are banished to a cabin away from other campers. After getting over there anger at one another, they start talking about their parents and how they share the same birthday and how they look exactly alike. Then they start to eat Oreos dipped in peanut butter. This is the point in the movie where they know something is up and that they are actually twins separated at birth. (Not because they look exactly the same or share the same birthday, it's totally the cookies. Powerful Disney moment.) I mean, if that food combination could do that for these girls, well what could it do for me? (so far not a damn thing) But I had the peanut butter and a few Oreos left from a ice cream cake and I needed to bake because I needed to so I listened to the innocent cute Lindsey's and make these crushed up Oreo and peanut butter cookies. And the world thanked me, but really, we should thank Lindsey too.I hear she could really use a win right now. And maybe I will eventually find a girl that looks like me and share my birthday and can be my twin too. I'll make her these cookies. The stuff. We are gonna need some white and brown sugar, vanilla extract, flax eggs, peanut butter and earth balance. Also flour, baking soda and baking powder, a little bit of salt, and of course, Oreo cookies. Add to a bowl the sugars, flax eggs, peanut butter, vanilla, and the earth balance. 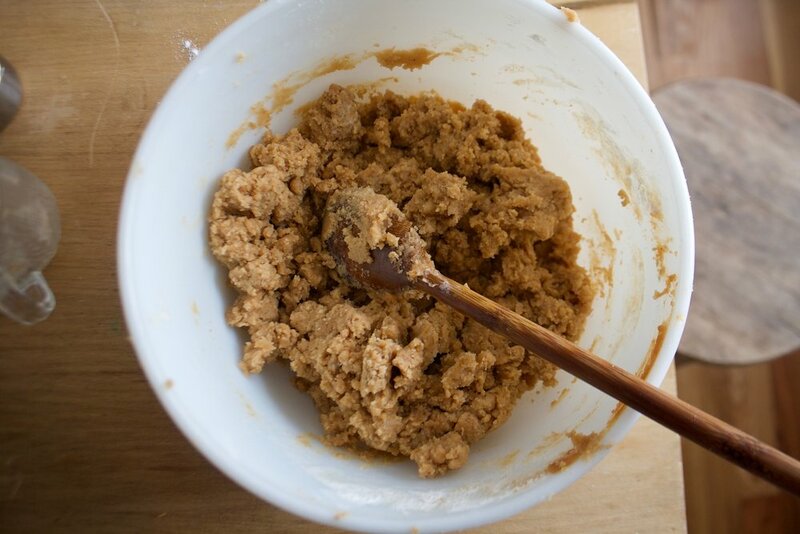 After mixing all the dry together, dump it into the wet and mix until cookie dough happens. Then add in your crushed Oreos! I just used my hands and crushed them directly into the bowl, but you could also stick them in a bag and smash them. Your choice. Cookies in the cookie dough.. Don't eat it. Ok, maybe eat a little. Scoop same sized amounts of dough onto a cookies sheet and take a flat something or another and smoosh the balls into flat disks. Once the oven is preheated, pop those suckers into the oven to bake. I did 12-13 minutes and they came out perfect. 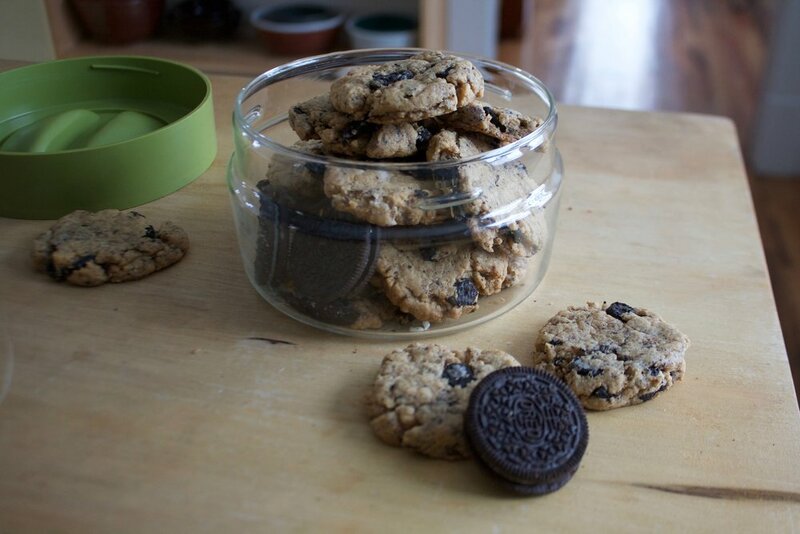 Now fill your cookie jar with al those perfect cookies and hide it. If seen, they will be devoured. Share with your long lost twin. In a large bowl combine the sugars, the peanut butter, vanilla, earth balance, and the flax eggs. Mix until all completely combined and smooth. In a smaller bowl combine the flour, baking soda and powder, and salt and whisk to mix. Dump the dry into the wet and mix until combined. Take Oreos and crush them into small pieces (I used my hands but you could stick them in a bag and smash them with a rolling pin or something) into the dough. Mix until evenly disturbed. Measure out same sized balls of dough and place them on a cookie sheet. Take a flat surface and smoosh the dough so it it a flat dish. 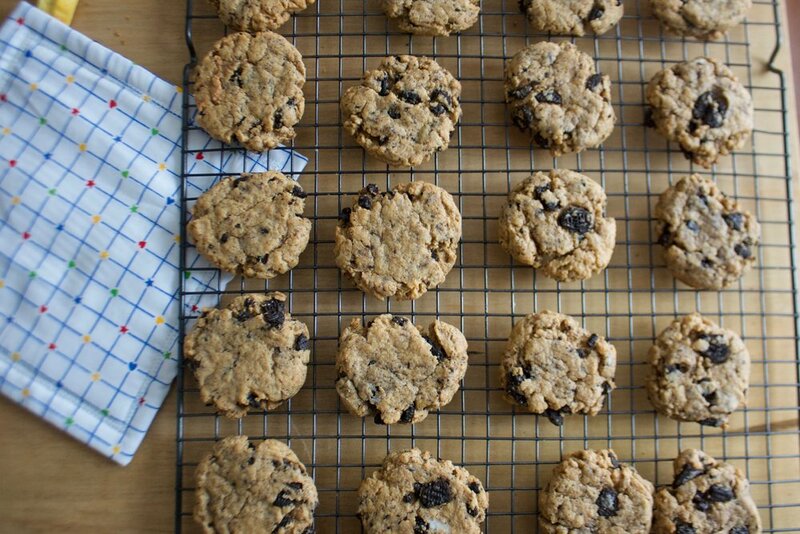 Bake cookies for 11-13 minutes or until the edges are starting to lightly brown. Remove and place on a cooling rack. Eat the cookies. Hide the cookies.